Below is a wonderful video demonstration created by Paul Taggart. This is a demo done “en plein air”. Its a fairly quick, energetic and sketchy painting, the point of which, is to demonstrate that oil painting does not always have to be a long drawn out process that takes days or even weeks to complete. Paul will be working in just two layers of oil for this demo. The first will be a somewhat fluid application. The second will add more texture using opaque color. The purpose of this exercise is to allow yourself to let go and paint what you see before you. As you watch the video, you will notice that Paul does not get caught up in details. He is painting shapes. Whether you are painting landscapes or portraits, it is helpful to look at things as a collection of shapes as opposed to a nose or a tree for instance. You will be amazed at just how convincing your paintings will turn out when you look at objects this way. There are lots of excellent tips and techniques that Paul will be sharing in this lengthy video. Too much to discuss here. So sit back, relax and enjoy. When you are finished watching this video, be sure to head on over to Paul’s YouTube page. There you will find many other wonderful and informative video demonstrations and lessons. 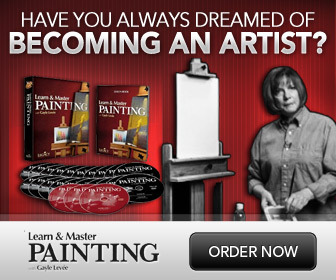 I guarantee you will learn a great deal from this artist. Be sure to also check out his Website Here for more excellent resources. Greetings Art Instruction Bog (alias Ralph Serpe)………… THANKYOU SO VERY MUCH INDEED for featuring our efforts and for sharing with your dedicated band of followers. YOU ARE VERY KIND and we do truly appreciate the time and trouble you put into watching the videos you feature and writing an individual critique. I am in love with the way you paint! Please tell me what brand of paints you use and what the names of the colors are? You are so concise in your explanations and I love the gentle relaxed way you teach, but please tell me about your colors. Who makes your orange-red color, for instance? Thank-you so much for your consideration.